Dental implants are the preferred method for replacing missing teeth, whether you are missing a single tooth or a full arch. The good news is that we can now replace a full arch of teeth with as few as four dental implants. 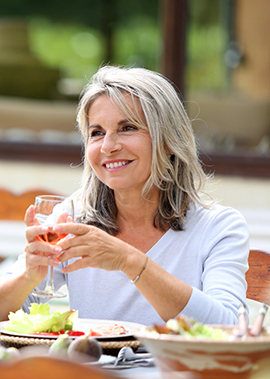 You don't need to live with your uncomfortable, embarrassing dentures another day. No more denture adhesive or nightly removal of teeth. Your teeth will feel natural and comfortable again. You'll experience the full taste and temperature of your food. No bulky plastic will cover the roof of your mouth as is the case with dentures. You'll have renewed biting force and will be able to eat a full range of healthy foods. No more diet limitations. Dental implants prevent further bone loss. Is it Really Possible to Replace an Entire Arch in a Single Day? Yes! Recent advancements in dentistry has enabled us to restore an entire arch of teeth (upper and/or lower) in a single day. With advanced 3D imaging we are able to precisely place the titanium implants to take advantage of your existing bone structure and utilize as few as 4 implants. On the same day, temporary non-removable teeth are attached to your implants, restoring your bite and smile. Once the implants have been given enough time to fuse to your jawbone, the final replacement teeth will be fabricated and secured to the implants. If you have missing teeth or are facing large amounts of dental work in an attempt to save your teeth, implants could be right for you. There are numerous benefits to having natural looking & feeling implant retained teeth. With this advanced technique, you will be provided with a full set of implant retained teeth in a single day! Your teeth will look, feel and function like natural teeth. No one will know that you have implants. If you are currently wearing dentures or are missing teeth, you will shave years off of your smile. Are you fearful of dental work? Sedation or general anesthesia is available. You will wake up with a new smile and start experiencing the benefits immediately. 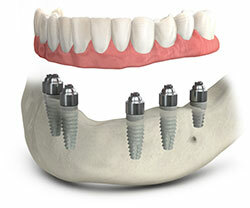 Published studies show a 98% success rate using dental implants.